After literally tens of hours measuring the distances via Google Maps measuring tool at very high magnification, I can confirm the distance to be absolutely what I thought it was going to be! Not included: General misadventure, wrong turns, unclear directions, cycling to find food or finding accommodation, cycling three miles in the wrong direction, because the cycleway sign had been twisted round. Multiple wrong turns, trying to find unlit cycleways, at night in the under-passes of Milton Keynes. I was honoured to be invited to Thrive’s Volunteer of the Year award on the 27th November. 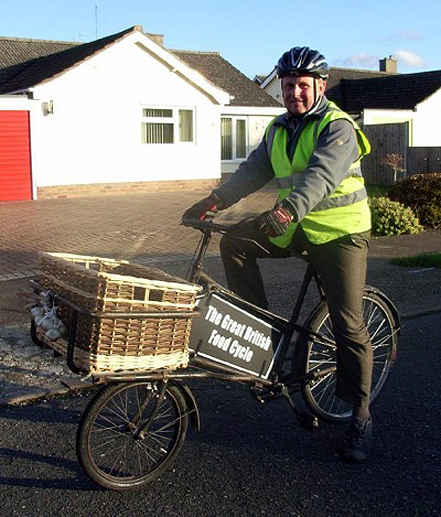 I was acknowledged for my cycle event and for my fund raising efforts. Had a great opportunity to meet all the wonderful people at the Charity’s HQ and look at their great work. 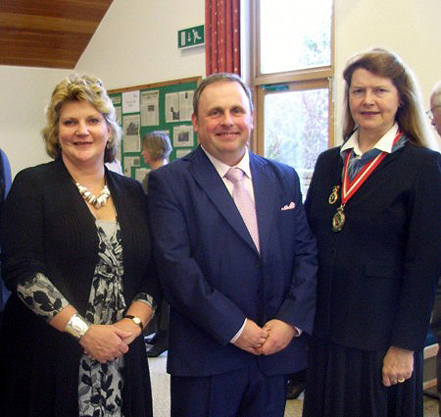 Chatted with Nicola Carruthers, CEO of Thrive, & The High Sheriff of Berkshire and her husband. Here is my chariot safely lashed ready for transit on a train. Heading for Diss and thenst to London. After almost 400 miles of cycling, in 56.5 hours in the saddle and goodness knows how many calories burnt. Plenty I hope! I worked out I averaged 6.6 mph my legs turned between 203,400 -219,000 on the pedals each. I need time to distill my travels. I have been asked to write a synopsis of my journey for publication. That will take some rumination. I am clear it’s a life-changing experience in a small way. Even if this adventure has nudged me one inch today, by next year I am several miles on a different course. I made it comfortably to Lowestoft seafront, on Friday afternoon before it got dark. 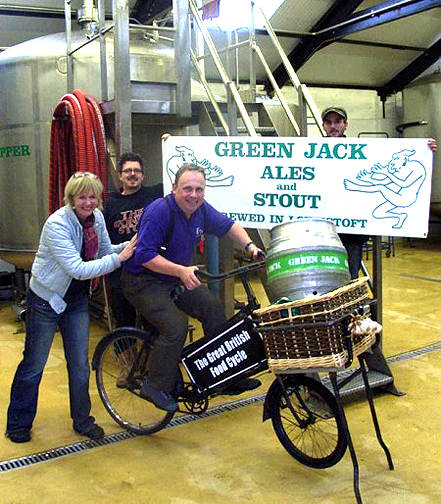 My final visit was to a micro brewery -Green Jack Lowestoft. Then the bitter sweetness of not being able to fit my bike on the train I had booked, as the basket wouldn’t fit thru the entry door. Here is a picture of me getting away with a keg of their famous ale. 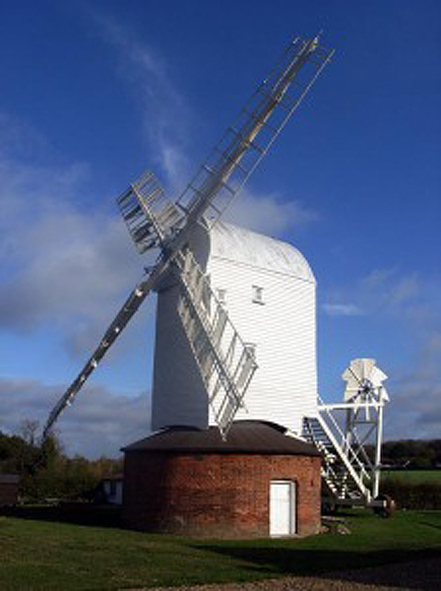 I dropped off a large bag of flour from Stanton post Mill at the Swan Inn in Hoxne near Eye. David was most surprized to have someone knocking on his door at that time of day. I had only enrolled him in the idea of being involved a few hours earlier. I had my first and only puncture today. 500 foot (200m) from my parent’s house. How lucky was that? 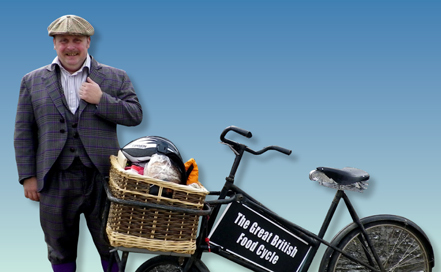 I clipped a tiny pothole as I passed though a cross-roads and a shard of flint cut into the tyre and punctured the inner tube. It was flat within 50 foot (20m). Thank you to Cycle shack, Chapel Str. Diss for their generous donation of an extra 20″ inner tube for emergancy. Lets hope I don’t get another this side of Christmas? I always get a thrill to see a working windmill and Stanton Post Mill is full operational. One of the only ones in Suffolk. Thank you to Linda for her donation of wholemeal flour that I took to my next Delivery at the Swan Inn in Hoxne near Diss. I misjudged the distance I had to cover today and I stayed off the very busy A14 too, by zig-zagging across country. I will have increased my distance total by perhaps 40% today, staying off the A-road. The small villages are so interesting either side of the A14 both west and east of Newmarket. I just got to Bury’s Tourist Information center and got a booklet of places to stay. I found St.Edmunds Guest House. Absolutely fabulous. Modern, spotlessly clean and efficient. Wow I got a reasonable nights sleep after dosing myself up with cold relief and getting an early night. I have got on with essential xchores, laundry and getting the bike fixed. The front brakes are almost completely useless. All the rubber shoes have worn away. I got soaked again today as I walked to town to see the city sites. Having a great time at the Cambridge YHA. So quiet I get lots of rest in a quiet room. Hot shower and packed ready for an early start tomorrow. Thank you to Raj @ The Curry Queen tandoori restaurant for getting his chef to make me a delicious meal with extra garlic and fresh herbs. I was feeling like death-warmed-up and a cold was coming. The best thing I could do is eat lots of fresh garlic and have lots of water. Hey thank goodness I have no friends …because I stink of garlic! Thank you Raj for your generous donation to our charity fundraiser too. 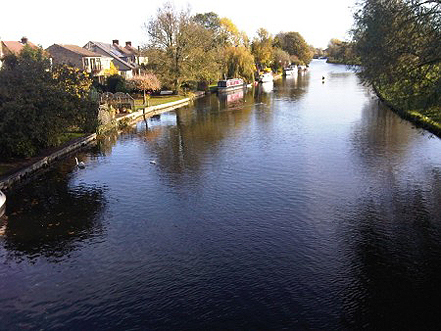 From Bedford to Cambridge I had a great time riding along the river Cam and picking up from Wally the Bee-keeper in Sandy, but then I got very wet and pretty cold andI am feeling not great. Yesterday was my bigest day and I am exhausted. 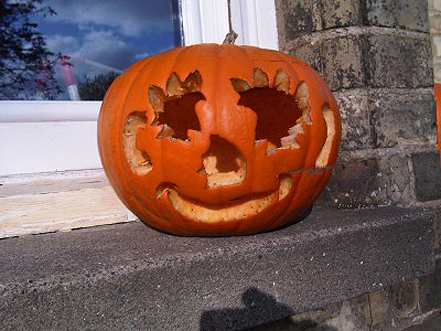 Here is the happiest Pumpkin I found after All Hallows night. He looks a happy-chappie. I stopped to take apicture on someone’s window sill because he seemed so cheery after a cold and blustery night. This pumpkin is obviously a morning pumpkin!